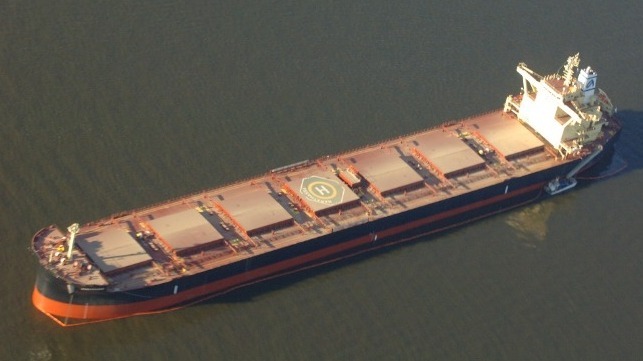 A Canadian judge has cleared the bulker Marathassa of four environmental charges related to the discharge of a small quantity of fuel oil into Vancouver’s English Bay, citing the operator’s efforts at due diligence. On April 8, 2015, a sailing vessel spotted an oily sheen in English Bay and reported it to the authorities. A spill response and cleanup effort was launched. The master and the operator of the Marathassa denied responsibility for the spill at first, but the following day authorities determined that the ship was the source. The cleanup and response effort lasted nearly six months, including more than two weeks of shoreline cleanup. The Canadian government charged Marathassa with discharging a pollutant; dischaging a substance harmful to migratory birds; failing to implement her shipboard pollution plan; and failing to assist with containment efforts. In a ruling issued Thursday, Justice Kathryn Denhoff agreed that the Marathassa had discharged a pollutant, but noted that the ship was newly built and that the discharge was caused by defects in its construction – defects that the operator could not have foreseen (and that experienced inspectors could not locate, even after the spill). The court found that Marathassa had a compliant pollution prevention plan in place and had trained its crew properly in the weeks prior to the spill, and ruled that this was evidence of proper due diligence – a valid defense against the two pollution charges under Canadian law. Separately, the court found that the Marathassa had not failed to assist with containment or failed to implement the ship’s pollution control plan.